The ATEX directive consists of two EU directives describing what equipment and work space is allowed in an environment with an explosive atmosphere. ATEX derives its name from the French title of the 94/9/EC directive: Appareils destinés à être utilisés en ATmosphères EXplosives. Areas classified into zones (0, 1, 2 for gas-vapor-mist and 20, 21, 22 for dust) must be protected from effective sources of ignition. Equipment and protective systems intended to be used in zoned areas must meet the requirements of the directive. Zone 0 and 20 require Category 1 marked equipment, zone 1 and 21 require Category 2 marked equipment and zone 2 and 22 require Category 3 marked equipment. Zone 0 and 20 are the zones with the highest risk of an explosive atmosphere being present. The regulations apply to all equipment intended for use in explosive atmospheres, whether electrical or mechanical, including protective systems. There are two categories of equipment 'I' for mining and 'II' for surface industries. Manufacturers who apply its provisions and affix the CE marking and the Ex marking are able to sell their equipment anywhere within the European union without any further requirements with respect to the risks covered being applied. The directive covers a large range of equipment, potentially including equipment used on fixed offshore platforms, in petrochemical plants, mines, flour mills and other areas where a potentially explosive atmosphere may be present. In very broad terms, there are three preconditions for the directive to apply: the equipment a) must have its own effective source of ignition; b) be intended for use in a potentially explosive atmosphere (air mixtures); and c) be under normal atmospheric conditions. The directive also covers components essential for the safe use and safety devices directly contributing to the safe use of the equipment in scope. These latter devices may be outside the potentially explosive environment. Manufacturers/suppliers (or importers, if the manufacturers are outside the EU) must ensure that their products meet essential health and safety requirements and undergo appropriate conformity procedures. This usually involves testing and certification by a ‘third-party’ certification body (known as a Notified Body e.g. 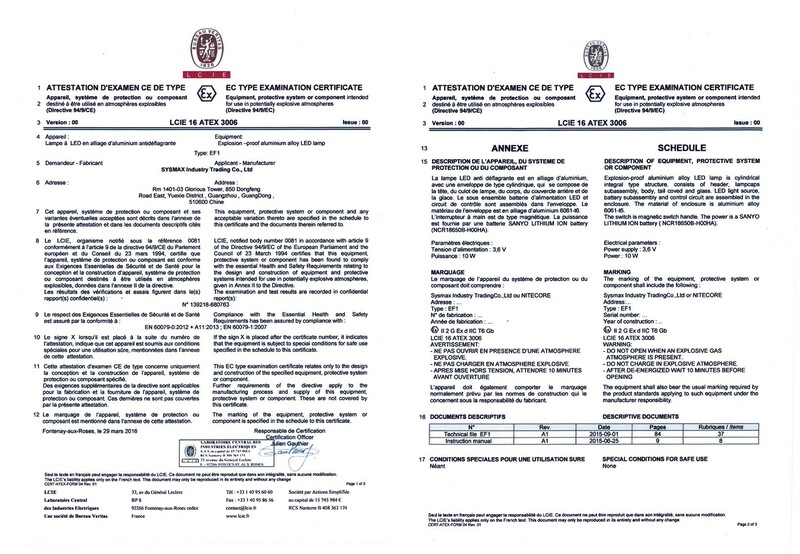 Intertek, Sira, Baseefa, Lloyd's, TUV ICQC) but manufacturers/suppliers can ‘self-certify’ Category 3 equipment (technical dossier including drawings, hazard analysis and users manual in the local language) and Category 2 non-electrical equipment but for Category 2 the technical dossier must be lodged with a notified body. Once certified, the equipment is marked by the ‘CE’ (meaning it complies with ATEX and all other relevant directives) and ‘Ex’ symbol to identify it as approved under the ATEX directive. The technical dossier must be kept for a period of 10 years. 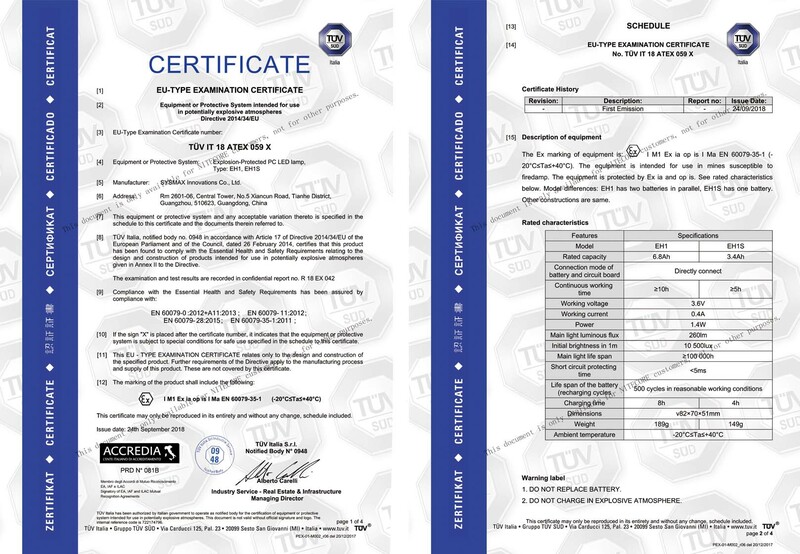 Certification ensures that the equipment or protective system is fit for its intended purpose and that adequate information is supplied with it to ensure that it can be used safely. There are four ATEX classification to ensure that a specific piece of equipment or protective system is appropriate and can be safely used in a particular application: 1. Industrial or Mining Application; 2. Equipment Category; 3. Atmosphere; and 4. Temperature. NITECORE Explosion Proof products passed all the tests and gained their ATEX Certifications from LCIE for NITECORE EF1 on September 1, 2015 and from TÜV for NITECORE EH1 and EH1S as they fully accord with the ATEX directives. NITECORE Explosion Proof products are originally designed to protect the user’s safety and strictly tested in terms of intrinsic safety, explosion proof, impact and water resistance to meet the EU regulations throughout the development process. With the ATEX Certifications, EF1, EH1 and EH1S are therefore better recognized by the mining industry around the globe.